A lot of consumers are taking the do-it-yourself route when it comes to installing their own TV mount, but do not have a clue what to do with the wires hanging below the TV. Concealing every wire and cable under your TV mount is the most difficult part of the TV mounting process. 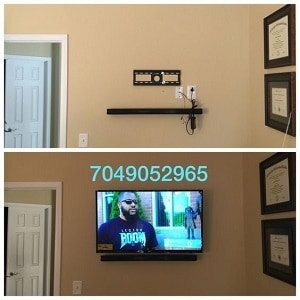 If your TV is already mounted on the wall but you are not comfortable running wires in the wall, we offer TV mount wire concealing and electrical outlet installation to make your TV safer and look better. “What tools do I need to conceal my television cables in the wall? The first and most important element of concealing your TV wiring is running power for your TV or installing an electrical outlet. Whether you have cable, satellite, a fire stick, game systems, an over-the-air antenna, or just use the apps from your TV app store, you need to install a power outlet behind the TV. You should never hide your TV power cord or an extension cord in the wall even if it is long enough. Running the TV power cord or an extension cord in the wall is a fire hazard and could void your home warranty! If you cannot install a power outlet outlet prior to mounting your TV, call a wire concealing professional or an electrician. 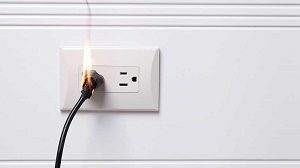 Starting a fire in your home is not worth the price of a professionally installed AC outlet. We install a power outlet behind every TV to ensure your TV installation is safe, meets electrical code, and adheres to NC safety requirements. 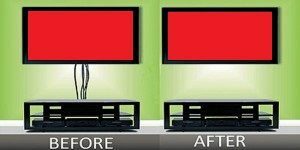 We can hide some devices like the Apple TV, small cable and satellite boxes, and various streaming devices behind the TV to save the cost of shelves and get rid of TV stands. We conceal 4K HDMI, Ethernet, optical and other A/V wiring and cables for sound bars and other components in the wall. If you have external devices such as a cable or satellite box connected to your TV, we will run the highest quality cables in the wall to your TV stand or shelf below the TV to ensure you have the best sound and picture. 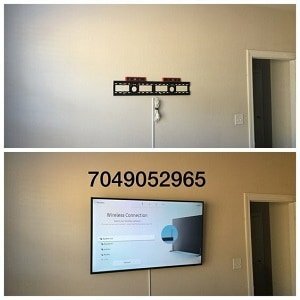 If you have a Samsung flat screen TV with a One Connect system, we can conceal the One Connect behind the TV or inside your TV stand. The Samsung One Connect box has several Audio/Video inputs including HDMI, coax for a TV tuner, optical, and USB. 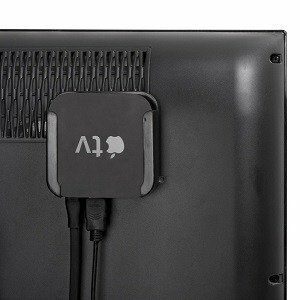 You can use the One Connect as an HDMI splitter to connect different devices in the future without touching the TV. Sound bars have become very popular due to the lack of sufficient TV speakers. Flatter smart TVs usually come with inferior speakers resulting in poor sound quality combined with 4k high definition picture quality. Our wire concealing expert carries sound bar mounts to attach your soundbar to the bottom of the TV so the power cord and optical cable are hidden behind the TV. 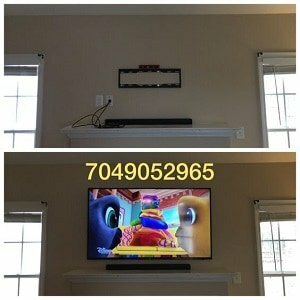 If you want your soundbar mounted on the wall under the TV with a few inches between the sound bar and the TV, we can hide the optical cable and power cord for the soundbar to give you a sleek look. Most new construction homes in the Charlotte area come with a pre-wired fireplace or a niche or nook above the mantle. Pre-wired means your wall has been previously wired for TV installation with an electrical outlet and AV cables by the builder or a previous owner and does not require wire concealing. If your fireplace is not pre-wired, we still have you covered. Our experience gained through years of cabling and pre wiring homes allows us to implement various methods of hiding and concealing your TV wires over the fireplace. What is your fireplace made of? Drywall, brick, or stone? Is your fireplace on an exterior wall or do you have another room behind it? Does the fireplace come stick out inside the room or do you have bookcases, cabinets, or shelves on either side? Worst case scenario, we may need to cut the drywall and run the wires through the studs. This is called a retro and is quite common for older homes without pre-wired fireplaces. We make 3-4 small holes to minimize the damage to your drywall. The holes are large enough just to route the wires through the studs from your tv to your nearest electrical outlet and whatever devices you have connected to your TV. We install wall plates over the holes and schedule a professional drywall repair service to repair all of the damage. He will restore your wall back to its original condition the very same or next day. Our drywall contractor will remove our wall plates, patch all of the holes in your drywall, repaint the wall, and make sure you are happy with the wall before they leave. After the paint dries, you will never know we opened the wall up. We use wire mold and raceway for brick and stone fireplaces, as well as concrete and brick walls where we cannot hide the wires in the wall. 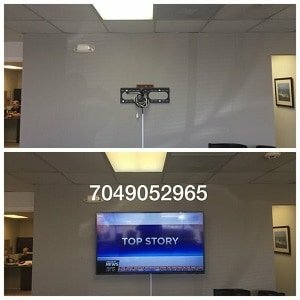 Some apartment complexes or office buildings allow TV wall mounting but do not permit drywall damage or in wall wire concealing. Tenants are told they can wall mount their flat screen TV but cannot hide the wires inside the wall below the TV. If this is your case or if you would just rather not have your drywall damaged to ensure you get your security deposit back, we can use white wire mold or plastic tracks called raceway. Raceway and wire mold have covers that quickly pop or slide off to conceal the wires inside. The adhesive sometimes damages the paint and drywall if left on for an extended period of time. We can use small drywall screws to avoid drywall damage when you remove the wiremold from the wall. All of our in wall wiring concealing services come complete with professional-grade wall plates to hide all of the holes we make in your drywall. We take pride in every job and make minimal damage to your home. You can get a quote on all of our TV mounting and wire concealing services here.